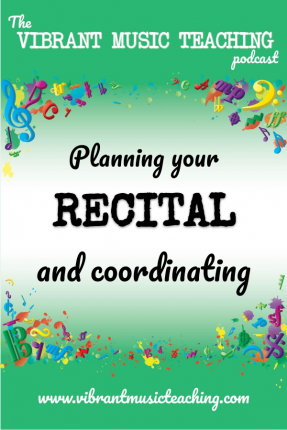 Are you apprehensive of getting started with improvisation in your piano teaching? In this episode, I’ll give you 3 super easy improvisation exercise to get you started and help you make your lessons more creative. Welcome to episode 36 of the vibrant music teaching podcast. I’m Nicola Cantan and in this show I’m gonna share three simple and easy ways to get started with improvisation. Well they’re beautiful teachers in this show I want to talk about some simple ways to get started with improvisation. Last week I shared with you my thoughts on improv and how I’ve come to see it as pool for actually teaching others stuff so it’s not just about something else that I have fit into my lessons. Although I do think it’s important to fit improv into all your lessons as much as possible but it’s not just about that. It’s also something that I can use to teach other things more effectively than just talking about them or learning them through notation or anything like that. And if that episode was a little bit too much for you if you’re just getting started with improv or you haven’t been able to do it at all consistently and you’re not that comfortable with it then this is the show for you because that might have all sounded lovely and wonderful and a little bit ideal idealistic rather than realistic. So you’re just getting going with improv it can feel pretty overwhelming. And I hope that last week’s episode will give you the big picture of where you could go with this and why it’s so important and can be a long term part of your studio. But this week is for those of you who are just getting started with this or need a quick and easy way to get back into using improv with your students. If you’ve fallen off the wagon a little bit. 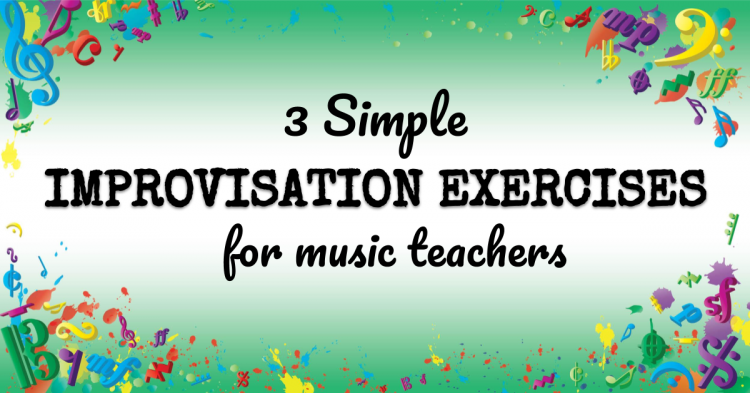 But first let’s talk about when you’re going to do these improvisation exercises because it can be really tempting actually for a lot of teachers I think to leave this until the end of the lesson. They think oh I’ll get all the stuff done and then we’ll end the lesson on a really high note do some more improv together it’s going to be wonderful. And that would be wonderful. And it is a great time to do it at the end of the lesson and finish on a high note. Wonderful. But chances are you do not have superhuman time control skills and you will run out of time more often than not. I actually love to do improvisation as one of the last things in a first lesson with a student because I can be a little bit more controlled about that. I don’t have a ton of stuff that I have to fit in and I can save those last five minutes for just improvising. So I love and improvise at the start and the end of a first lesson with a new student. And I do think it’s a great great way to finish off a lesson. But I just want to caution you that if that’s your plan it might not happen at all right. So if that’s you if you’re thinking Yeah honestly I tell myself I’m going to finish the lesson with improvisation every week and it just doesn’t happen then maybe you need to consider one of these alternatives. So the first is just the direct opposite. Start with improvisation. Start with improvisation and use it as your warmup. We all know and I’m sure we’ve all had these lessons. I know I have growing up where you arrive to the lesson and you basically had to dive right in maybe two scared that you were being or it felt like you were being tested on or a piece that you were being held accountable for. And while that can sometimes be beneficial if a student is preparing for something where they’re going to have to walk up on a stage or go into an exam room completely cold and just perform straight away in a high pressure situation like that that is a good practice for them to do. But if they’re not going to be in that situation then why would we make it so hard for them to succeed at the first step of their lesson. You know what I mean like you walk into your teacher’s room you haven’t played on their piano in at least a whole week probably it most likely feels quite different to your home instrument maybe even you have students who have digital pianos or keyboards at home. So the keys feel completely different. The dynamics work differently everything is different and you’ve got someone watching you as much as you may love your teacher they’re watching you and you can feel the pressure of that. And that’s the first thing you do in your lesson. It can often set you up for failure. So that’s why I love improvisation as a first thing to do in a lesson because although some students may be cautious of it it is kind of the definition of a no pressure situation because there is nothing you can do wrong especially after a few weeks of doing this. When students are becoming more comfortable with the idea of improv it’s a great way to loosen up and just get comfortable with the piano get back into the swing of things with your teacher and have some kind of success right from the get go right from the start of your lesson. So that’s a first suggestion Make for when to do these things is just at the start of the lesson. Another great time to do them is in buddy time if you’re teaching buddy lessons like me then doing improvisation during that time is fantastic because you can get one student to play the lower part the second part of the complement and the other student is improvising with the scale and then they swap. I won’t go into that too much now because I will do a whole show about how I do that in the future but that’s a great time to do it. If you have that situation in your studio that lesson format you can also use it as a brain break. So improv can be a great brain break between different pieces you’re working on or between repetitions of the same piece with the same section or whatever you’re working on with the student. If you have one really sticky spot and it’s about the middle point of the lesson and your student is fading a little bit especially if they’re on the young side they may be getting really take a break from that for a moment get up shake the way goes off and then improvise together and then come back to it there’ll be so much fresh air they’ll actually get more done and you won’t have brought them to tears right. We all know well I don’t know if you know but I know my teacher growing up would say things like OK just play that ten more times and I try never to say that that kind of thing to my students or although it has slipped out from time to time but yeah just repeat that 10 more times was always the soul crushing thing because I knew it wouldn’t actually be 10 either I would get to 10 and it wouldn’t be good enough and then I have to do it again and again and again after that. So if you’re getting into one of those ruts where you just want the student to get something and they’re not. And so you’re repeating it over and over. Yes repetition is important but always stepping away from things so that you can gain clarity on them and do them better. So improvisation can be a great way to do that. So my number one suggestion would be just start lessons with this. And the second idea would be to do this in the middle of the lesson when you need that brain break or that attention shift to something else. OK so that’s when to do it. But what are you going to do if you’re just getting started with improvisation and you haven’t even done it by yourself or you have by yourself but at a very high level and you don’t know how to bring it to students then I’ve got three great ideas for you that are going to get you started. The first one is to use improvisation to introduce an interval or practice an interval. So this could be an interval that’s gonna come up in your student reading work or that they’re going to have repeated a lot of times in a certain piece even if they’ve met it before something like that. For example I’m teaching a student at the moment this piece called the gypsy’s by Cuthbert Harris and it has loads of Sixth and fists. So one had to be playing a fifth and the other is playing a six. And the combination is what really gives it sound so improvising with those two intervals side by side or one at a time is a great way to work on that and you can do this with any interval so if a student is just working on steps or skips or if they’re working on octaves or anything doesn’t matter which interval it is this is a simple exercise you can do what you’ll do is you start on the lower side of the piano and you play something using that interval. So let’s take the example of a six. So you’re gonna play six and you might do them in both hands or you might do that. The root note from the interval in the left and then a sixth in the right hand and just play around with it come up with a simple repeating pattern. Doesn’t matter what it is you can even just be for straight beat. It can be that simple. In the paddle and play around with it and find some intervals that sound good to you and that’s all that is. That’s all you have to do your student is then going to play the sixth melodically so you’re doing harmonic they’re doing melodic and you can either specified that they have to do all six. They can only go up and down in six or you can say okay only do six and steps seconds so that they can change where they are. Although it is fun to do wear it even if they are getting stuck in one pattern because they’re only allowed to play a certain interval. It can actually be interesting to see how much they can come up with out of that. I remember Christopher Nordin I think it was mentioning that he did improv where he asked a student to only play one note and make it sound interesting. That was his challenge to them. So it certainly can be a fun challenge. But I would suggest maybe your chosen intervals though say six and seconds so they can always do both of those and they’re just as will play around and see what they can come up with anything that they like the sound of you might want to also work in the key that your students piece is going to be in the piece I was talking about there is it a minor so I would just tell them to play all the white keys and ignore the sharp in 7th for a while and yeah just play around with it then swap places so that they get the chance to try it. The harmonic version and you get the chance to try it the melodic version of the interval take note together of which one sound good and which ones don’t sound good and maybe take out some staff paper and get your student to notate their favorite ones so maybe they really liked the combination of g to e or whatever it was whichever one they liked the sound. Get them to notate it you might even compose a whole piece but you don’t have to. Improvisation doesn’t always have to lead somewhere it can just be an exploration and it can be a preparation like this is four pieces or reading work that they’re doing or technique or anything else. So exploring an interval is a great easy way to get started. Try it out yourself and maybe come up with a pattern if you’re super nervous about this idea say you decide on your interval that you want to introduce to this student and then come up with your own little pattern that you’re going to play so that you’ve already decided it and you know it’s going to sound decent and then they can play on top of that and they can come up with their own pattern when they swap roles with you. OK so that’s an improv idea number one I hope you’ll give it a go. Number two is to do a 1 5 6 4 improv. I’m sure you’ve heard of this pattern but if you haven’t. This is basically the most common chord progression ever. 1 5 6 4. So it started in C if you’re a student as a beginner. Nice and simple. And you’re going to play the chords again down the bottom like you did on the previous. The interval based improv you’re going to do the same thing you’re going to play chords and root notes so do octaves in the left or just single notes and chords in the right hand and just repeat them again. It can just be a straight even for crutches or for quarter note pattern or you can vary the rhythm a bit make it a bit more interesting either way will work fine your improv accompaniment does not have to be super fancy and amazing and full of tricks it can actually be simple and it can work better when it’s simple because then your student has more space to explore. You don’t want to actually take up all the interesting the interest rather in the Emperor. You want to leave them some room to explore with their improvisation. You don’t want to crowd them right. So to do this improv you’re just going to play one five six four chords in the right root notes in the left your student is then going to improvise using the matching scale. So if you’re in C They improvise using the C scale where you can tell them just play any white notes any white keys and of course if you’re teaching an instrument other than piano then you’re going to want to choose a scale that’s appropriate. D Major for violin or whatever suits you and your student and just alter the key to suit that. A great way to illustrate this with your student and how relevant it is and how chord progressions build most of music is a site called Hook theory. So if you go to hook theory dot.com slash friends there’s this really cool interactive thing where you click on a chord and it shows you the next most popular chord in percentages. 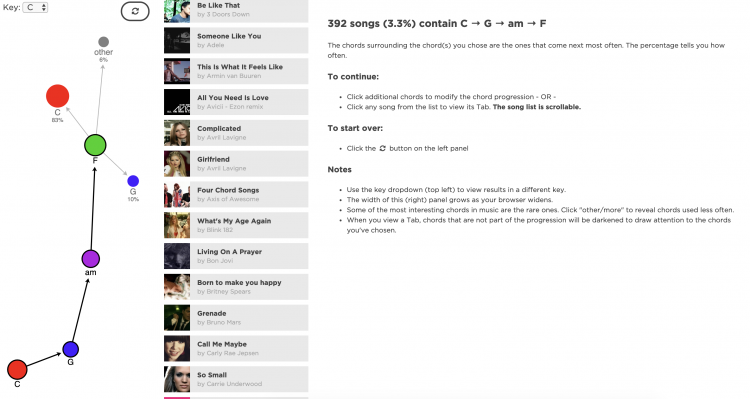 So if you click on C the next most popular chord to go to is G. And then it’s a minor and then a death. So it’s this exact progression. So showing them that can be a great way to illustrate it. I’ll also leave a screenshot of this in the show note so that you can see it so that that vibrant music teaching dot.com slash 36 3 6 Yeah you can hop over there to see it and also to get the link directly talk theory so you can explore this tool is really fun. I have loads of these accompaniment patterns and ideas and a whole structure built around this idea of improvising with scales and chord progressions in my course which is called circle of fifths odyssey. So that’s the vibrant music teaching members if you haven’t explored it and you’re a member check it out if you’re interested in this approach and if you’re not a member and you want to sign up. Of course you can go to VMT dot ninja and sign up and get access to that course straight away. Okay our last idea to get you easily started with improv I wondered you just three so that you don’t have so much choice that you get overwhelmed and don’t do anything. I really want you to get started on this so third idea and final idea for today is the 12 bar blues. This is obviously a very popular pattern and a great place to start with improvisation. If you’re not familiar the twelve bar blues is just for ones two fours to ones five for one one or five. If you want to repeat and again I have a simple chart and a whole activity pack based on those called bluesy sound cards so that’s in the library for members. If you want to grab that as well as having the improvisation cards and the prompt in there it also has a simple chart which I find very handy and I use even when I’m not using the cards. That’s my favorite way to show it with the Roman numerals or I have it written out in C as well. So exploring the twelve bar blues is a great place to start with improv because the scale has the built in cool right. If you just play at loose go up and down it basically automatically sounds cool. You don’t have to do that much of course you can do a lot with it but you don’t have to do much to make it sound good. It’s like the pentatonic bozos. They just have the built in sound already. If you just simply go up and down them so it gives a student a really good chance of sounding amazing. I recommend you start in two keys so I recommend you actually start in E flat and then also explore C so E flat because the scale is easier and c because the chords are easier. So I would explore it first with me in the lower part during the chords. Again to company just keeping it simple following that twelve bar blues format and I would make it a 24 hour bar blues just give more time to explore and then the student is exploring the E flat blues scale which is just all the black keys and a natural. That’s why it’s easy right. It’s easier when to remember the pattern for and then we would transfer that to C and I would teach them the pattern and depending on the students level and age I might put little sticky tabs on the keys to help them remember the pattern in C. Some students need that some don’t but you don’t want them to be so concerned with remembering which keys there are and aren’t allowed to play that they kind of freeze right. So if they’re having trouble navigating it just put those sticky tabs on the keys and see if they can explore it more freely that way and then swap places with them and have them do the pattern from C and then maybe the pattern from E flat when they’re playing the chords so you do a flat first and then see when they’re doing the scale and then see you first and then E flat when they’re doing their chords just makes it easier for them to jump in and it makes a nice flow to the exercise of course you don’t have to do all that in one lesson if you don’t have time. That could be over four or six weeks that you explore those different keys and different ways to play it now in two weeks on the podcast. I’m actually going to be sharing a group version of this that I do so I use a twelve bar blues a lot actually in my group workshops as a big ensemble with lots of students at loads of different levels so that’ll be in two weeks here on the podcast if you want to stick around for that. And if you’re interested in the group approach to this. But for now get started on one of these ideas for your students one on one or in small groups or whoever you normally teach. Pick out one of them. Just one. Think about all three. Whichever one sends the easiest to do that one is no wrong choice. Just do the one that feels comfortable to you and you feel like you’ll actually do and then do it with every student this week. That’s my challenge to every single student. And that’s why the start of the lesson is perfect right. So if you just start every lesson with this same exercise that you’ve chosen it won’t get boring. Every students interaction with it will be so different. They’re doing the same thing for a whole week will not get boring for you. And of course it won’t get boring for your student because they don’t know you’ve done it all week and it will get you comfortable with at least that one type of improv. And I promise you I know this from experience. Once you have gotten comfortable with one way to improvise with your student everything else opens up. One day I got myself fully started and started to get comfortable with it. All the other options I had available made sense and I was able to bring them in little by little and expand the range of different types of improvisation exercises I could do with my students. But it takes that one step and it takes doing it lots of times so that you really feel good about it. OK so make your decision one of those three try them out for a whole week and then let me know how goes. I’m really curious to hear if this is the moment that you finally dived into improv. If you’ve been apprehensive of it for a while or finally become consistent with it. If you struggled with that in the past. So let me know about it. You can go to the show notes vibrantmusicteaching.com/36. That’s the numbers 3 6. Or you can of course catch me in the Facebook group vibrant music studio teachers just search Facebook for that and it’ll pop up and I’ll be happy to chat to you there next week on the podcast. We’re gonna be talking about improving our students duet skills. One of the big things I want for my students is that they are not alone. They do not feel alone in their piano studies and they don’t only play alone either. They play lots of duet but duet playing is a whole other set of skills. So next week I want to talk to you about how to improve your students duet skills how to bring duets into your studio and make them really successful and an enjoyable experience for your students. So that’s next. Next week I also have a webinar coming up just after that which is all about fitting improvisation into your lessons and making it a regular part of what you teach. So I’m guessing if you’re finished to the whole way through the end of this episode then that’s going to be something you’re interested in. You can go to vibrantmusicteachingdot/regular to sign up or catch the link in the show notes so that’s on Friday week as this podcast goes live I hope to see you there. In the meantime enjoy your improvisation happy teaching and I’ll chat you soon. If you want more improvisation prompts ideas and step by step frameworks to help you improvise with a purpose with your students. Then you need to check out vibrant music teaching. Go to VMT.ninja and sign up today. The above audio transcript of “VMT 036 – 3 Simple Improvisation Exercises for Music Teachers_DELIVERABLE.mp3” was transcribed by the best audio transcription service called Sonix. If you have to convert audio to text in 2019, then you should try Sonix. Transcribing audio files is painful. Sonix makes it fast, easy, and affordable. I love using Sonix to transcribe my audio files.